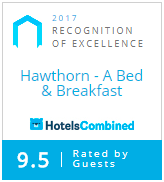 Hawthorn B&B . . . more than a century of hospitality! Hawthorn B&B offers unique lodging accommodations in Independence, Missouri. Built in 1900 by John A. Gallagher, this two-and-a-half-story stone house was the Gallagher family’s country home known as “Hawthorn.” Named for Hawthorn Station on the Kansas City & Independence Electric Railway and the Hawthorn trees on the property, it was a ten-acre estate complete with barn, pastures and livestock. John had always wanted to have a farm on which to “rear” his family. However, he and wife, Florence (Cole) Gallagher, and their four children, Dorothy, Mary (Louise), Helen and John C. maintained their permanent residence in Kansas City, Missouri. As a young boy of 13, John served as a pharmacist’s apprentice in Scranton, Pennsylvania. In 1876, he came to Kansas City, and with Dr. J.C. Eaton opened a drugstore at 8th & Main. John’s success in the wholesale pharmaceutical field led to his building the first wholesale drug company in the area. In 1912, his career reached its peak as he became President of the Faxon & Gallagher Drug Company and served in that capacity until his death in 1923 at age 71. Florence was born in 1861 to Granville and Lucretia Hite Cole of Collinsville, Illinois. She received her education at the Visitation Convent in St. Louis, Missouri. Her father, a lawyer in Collinsville, moved his family to the Kansas City area in the 1880s to enter real estate and banking enterprises. He was a Director of the old Bank of Commerce, a predecessor of the Commerce Trust Company. At age 31, Florence married 40 year old, John A. Gallagher. Their first home was located at Independence Avenue and Woodland. Florence was known for her work with private charities, and she was a member of the Woman’s City Club, the Amateur Flower Garden Association and the Tabernacle Society. She loved entertaining and Hawthorn was the site of special luncheons and socials for notable Independence ladies’ groups. Following John’s death in 1923, caretakers maintained Hawthorn, and in 1925, Florence sold the property. The next residents of Hawthorn were the L. Fred Evans family. Mr. Evans was Vice President of an area retail dry goods company. Longtime Independence residents suggest that it was Emery, Bird, Thayer, a well-known Kansas City department store. Rebekah was the daughter of Judge and Mrs. Richard Fields. She and Fred had three children, Richard, Rebekah and Frederick. The family lived at Hawthorn for nineteen years, and in 1944, widow, Rebekah, sold the beautiful home to Mrs. Lottie Gillmor. Lottie Gillmor, widow of Dr. William L. Gillmor, moved from Fairmount to Hawthorn and lived there for sixteen years. The late Dr. Gillmor and his wife Lottie, had three children, Dr. C. Stewart Gillmor, William L. Gillmor, and daughter Carol Gillmor Elliott. In the 1950s, Lottie gifted a portion of the Hawthorn property to the Westminster Presbyterian Church at 9601 Wilson Road. It would later become the new location for Westminster. Then in 1960, and according to Lottie Gillmor’s wishes, Hawthorn’s ownership changed. Following her death, Lottie’s children sold the stone mansion to the Westminster Presbyterian Church and for the next forty years, Hawthorn House served as administrative offices and educational space for the Congregation of Westminster Presbyterian Church. In late 1999, Fred & Patricia Bibler purchased Hawthorn from the Westminster Presbyterian Church (now Trinity Presbyterian Church) with the intent to develop Hawthorn into a bed & breakfast. Beginning in January 2000, Hawthorn was completely renovated and returned to its original magnificence. Hawthorn, A Bed & Breakfast, opened its doors in the fall of 2000 to guests, events and “special luncheons and socials for notable Independence ladies’ groups”. The second floor has four beautifully decorated guestrooms. Each room is named in recognition of past owners; The Gallagher, The Evans, The Gillmor and the two-room Westminster Suite. A fifth guest room, The Elliott, is located on the third floor of the mansion, and our sixth room, The Bibler Suite, is our two-room suite named after the founders of Hawthorn, A Bed & Breakfast. In June of 2006, a new generation purchased Hawthorn B&B. Jim & Wendy Allen are fulfilling a longtime dream of owning and operating a bed & breakfast. Frequent travelers themselves and having stayed at numerous B&Bs across the country and in Europe, they bring their creative, relaxed down-home hospitality to Hawthorn B&B. Each overnight guest experiences Jim’s complete homemade breakfast. …Thanks for giving us a real sense of a “getaway” into a new beautiful world.